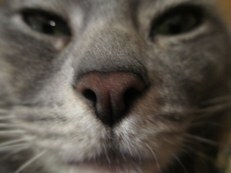 Does a cat’s nose always know? 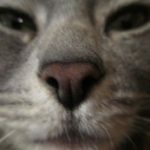 The Animal Behaviour, Cognition and Welfare Group at the University of Lincoln in the UK recently did a study (Individual differences in visual and olfactory cue preference and use by cats (Felis catus)) that gives us a little more information about how cats use different cues to make decisions. The test used a standard “T-maze” where an animal goes to the end of the runway, and has to make a choice: turn right, or turn left. At the end of the runway were two flaps, with different combinations of color and olfactory cues (each cat had their own combination). For example, a green square paired with pine scent could be one cat’s cue suggesting food. The blogger's representation of the experimental apparatus. Cats walked down the aisle of the maze, and were met with two choices. In this example, the S+ (rewarded side) would have a green square and pine scent. The S- (non-rewarded side) would have a blue square and mint scent. Once the cats were making correct choices 70% of the time (hey, Cs get degrees, right? ), they were ready to graduate to the test trials: Now on occasion, between regular trials, the visual cue for S+ (say the green square) was swapped so now it was paired with the olfactory cue for S- (mint), and the blue square was now paired with pine scent. On those trials, the cat’s decision was recorded, but no food was given. What would they do? Would the cats be more swayed by the visual or olfactory cue? Six cats (all spayed and neutered, some from homes and some from an animal shelter) successfully trained on the apparatus and completed the experiment. All cats except one seemed to prefer the visual cue to the olfactory cue when they were in conflict with one another. However, a follow up test with only the olfactory cues demonstrated that this was not just because cats cannot learn an olfactory cue (they can); the follow up test was important because it demonstrates that the reason cats chose visual cues wasn't because the scents were too jumbled up (scents do like to disperse) or not strong enough to be detected. Those five cats just gave the visual information more priority than the scent. With such a small sample size, it’s hard to say that this is true of all kitties. There may be some individual differences in preferences based on cats’ experiences or abilities. Maybe indoor cats experience a much less rich olfactory world than cats who go outside, or perhaps they use visual cues more in certain contexts (a well-lit room) than others (a dimly-lit dawn hunting experience). 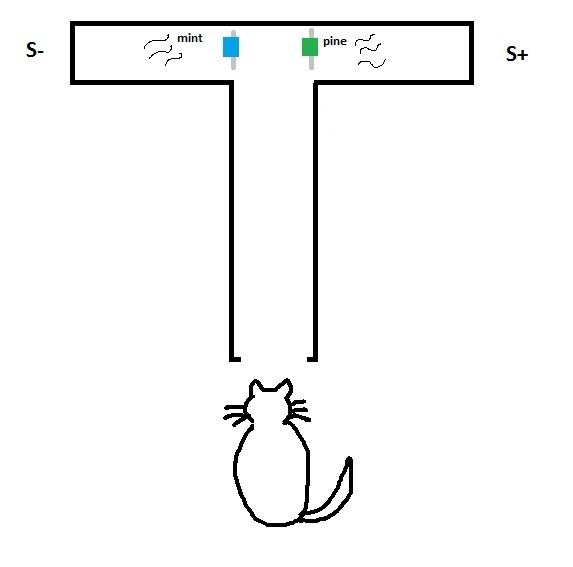 However, this experiment is a nice first step at getting a better idea of how cats parse out information about the world!